Friday, we arrived 4a.m. 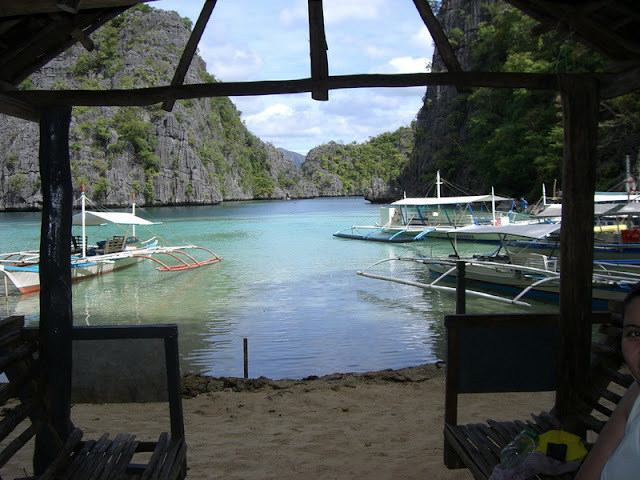 at Coron. Not knowing where exactly is Seadive, a tricycle took us there. The tricycle in Palawan quite differ in design from the ones in Manila. The seating at the rear resembles the jeepney's. A big lit up panaflex sign greeted us upon arrival at Seadive entrance. We passed through a narrow passageway and crossed a concrete footbridge towards the 3-storey building. 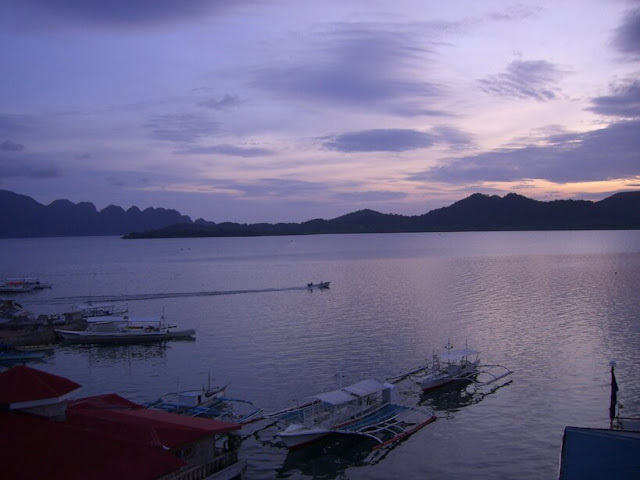 Seadive is located over the waters of Coron Bay, it was still dark and all we saw was the still waters, but when the sun rose, the vast image of islands/mountains appeared upfront.We waited for a few hours at the restaurant til opening. Bamboo cladded the whole restaurant and the furniture are of heavy hardwood. While we made ourselves comfortable, a group arrived. we met Mang Roberto, a tourist guide for 18 years, with the 3 foreigners. We had a short conversation with him. 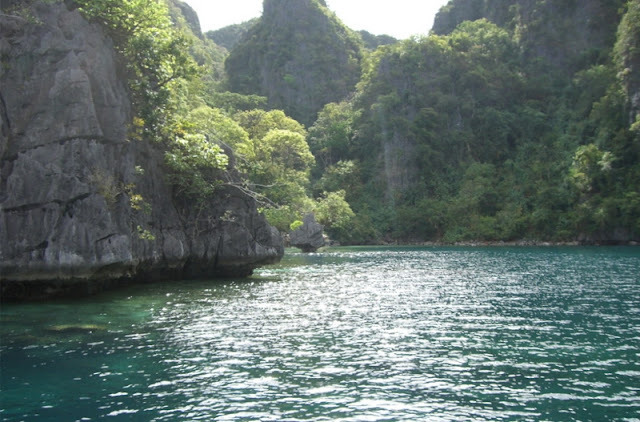 Having only a few days stay in Palawan, we asked him if he knew an alternative transpo to El nido, because there are no flights available the next day. He suggested renting a boat for 20k for 8 hours trip. We felt like we can't face that 8 hrs ordeal on a small boat, out at sea. So we had to carry on with plan b which is to stay in Coron, than the first plan of hopping from Coron-El Nido-Puerto Princesa. 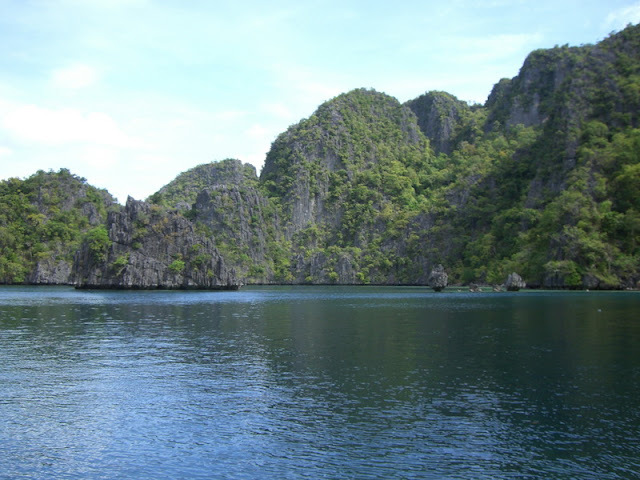 There was another way to get to El nido via ferry available on Tuesdays only. It was about 9am when we got our simple room. When went to the resto to sched our boat for the island hop. 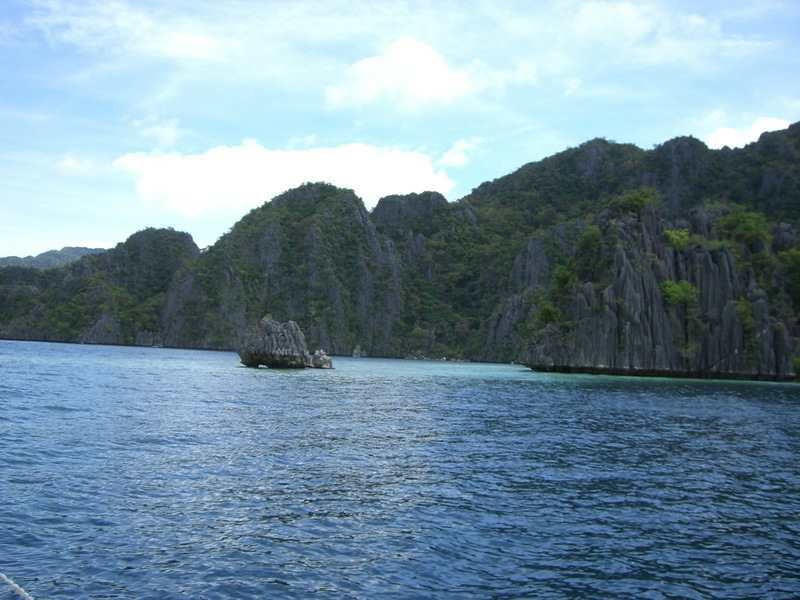 The place was packed with foreigners,we were the only Filipino guests that moment. It was a bit odd; I've never felt foreign in my own land before. They seem to be so used to the place and we "are" the foreigners. They were there for diving. 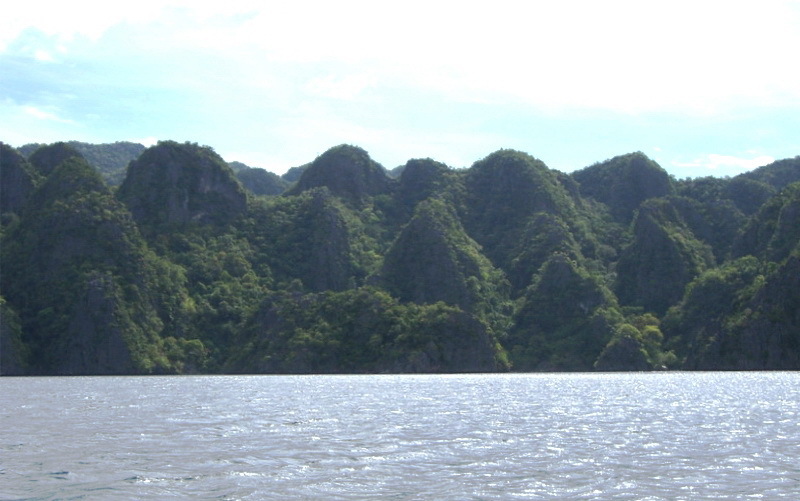 Coron is known for Japanese ship wrecks. 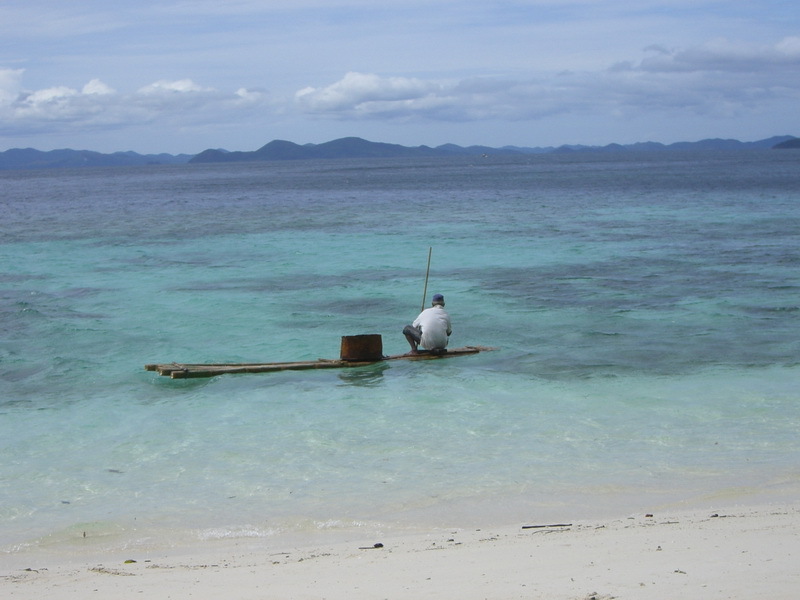 We met up with Mang Bernie, hopped on our very white motor boat which is bigger and sturdier than the ones in Boracay. 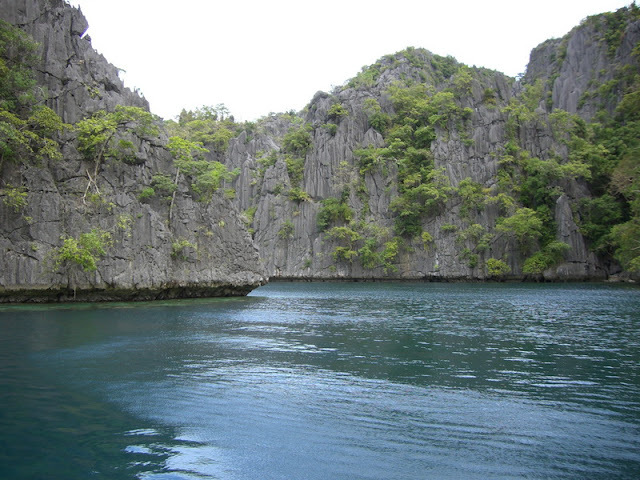 He took us to Coron Island which is made out of massive limestone formations. 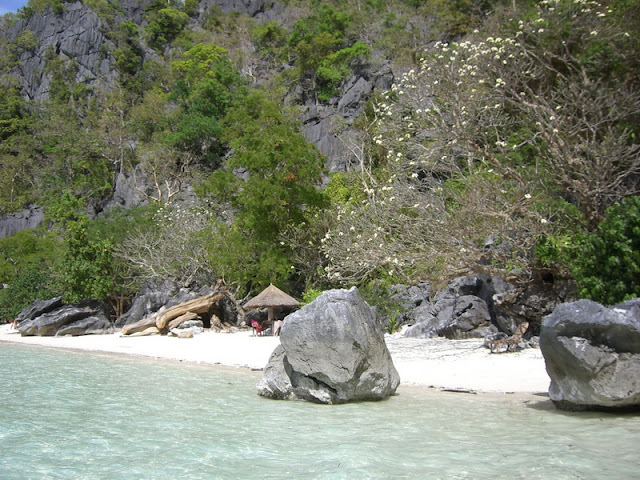 There are secret passages/lagoons between the rocks. It 's dramatic when we entered the Kayangan Lake; of still dark blue green waters surrounded by limestone walls. It has the title of cleanest lake in the Philippines for years. It's calming, grand and totally beautiful. Then, we had to climb up to the other side to Barracuda Lake which is really, really deep. 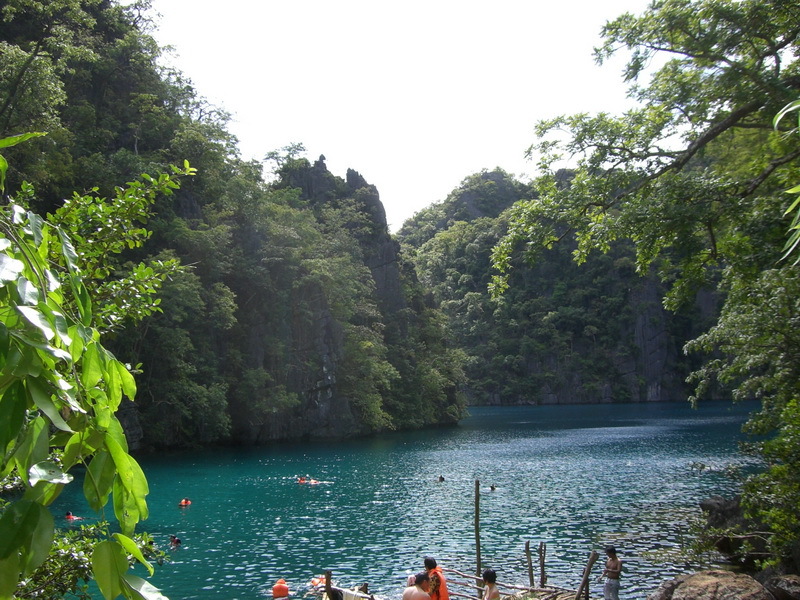 Coron Island has 7 lakes. Our 2nd hop is at the Blue Lagoon,again quite breathe taking, and making you wish you wont have to go home. The water varies in color from light green to dark emerald. The place enchanted and I loved it. We stopped at a very shallow part. Upon the clear water, we saw new corals and sponges. The water is lucid from the spores, as if someone poured oil on it. Just sailing along the island takes much of our time, and it was fun as it is. I loved the 3rd spot, Banol Beach. A white sand beach at the side cove of the island which is owned by the Tagbanua tribe who still takes care of the place. The sand is fine and the water calm. When we are about to go into the water, when the old folk told us to beware of sea urchins which he spears or fish out to sell. They thrive in the grassy portion. We got to see his half a drum catch. I've learned that pee can cure a sea urchins sting and as vinegar is to jelly fish. Though there wasn't any jelly fish that time. The beach is where we really had time to relax while soft clouds scattered the blue skies. 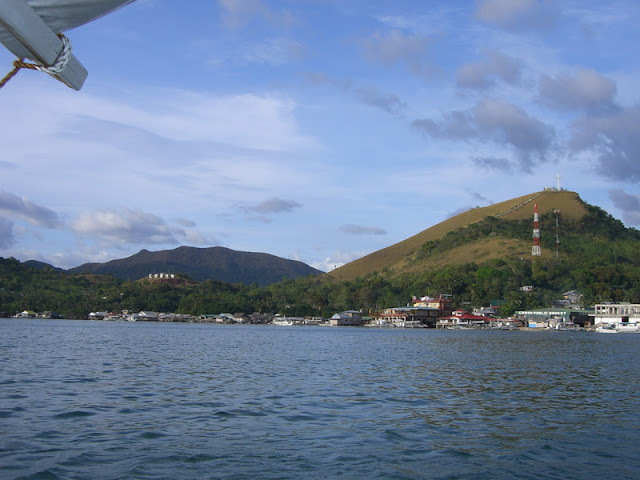 With few hours left we went to CYC island, out last stop. Mang Bernie brought us far out at sea where the water is waist high. It was fun, a full span of shallow clear water. 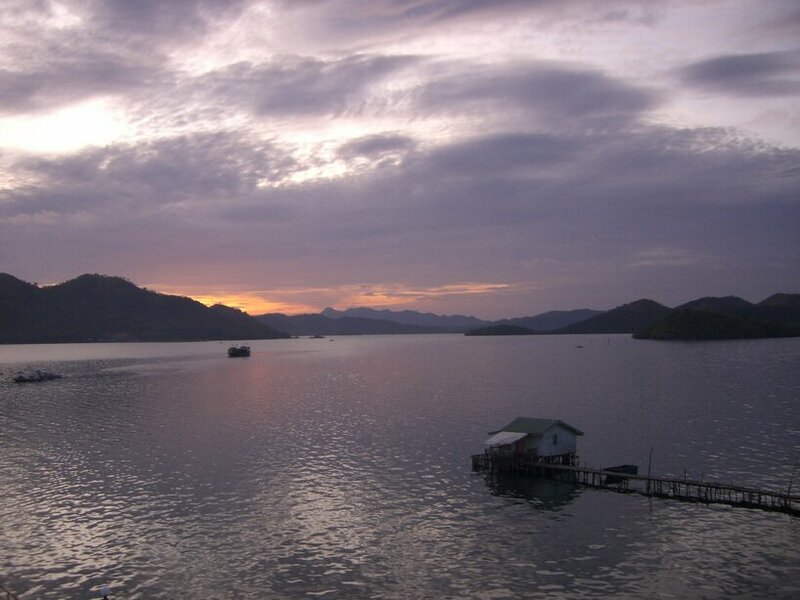 That night after the island hopping, we roamed around Coron Town.There are only few places to eat and shops close early. It gives you the feeling that it's not a time to be choosy when it comes to food, so we tried the eatery nearby. Owned by a family, we saw them with bird's nest(balinsasayaw). 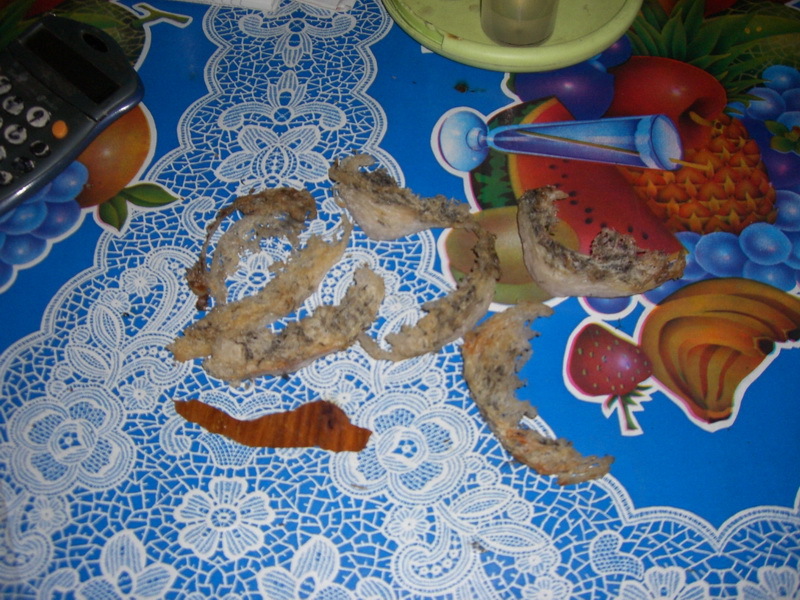 A very expensive Chinese delicacy used for Nido soup. It costs thousands per gram, depending on the grade. 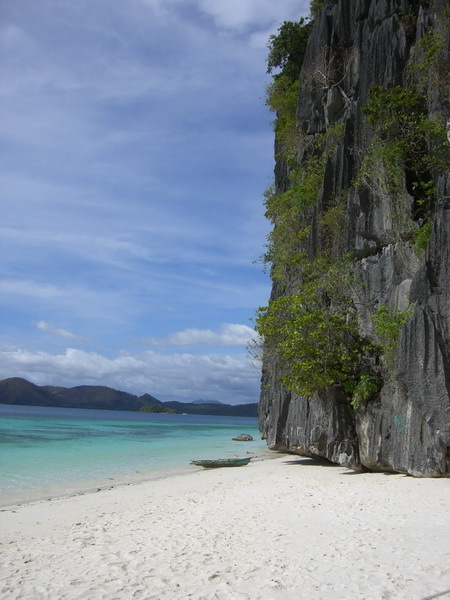 It's one of the products of Palawan. The nests are harvested from the very deep crevices of the limestone walls all around Palawan. It's a death defying job. They clean it and even the itsy-bitsy dirty part can be sold. I bought some fruit from a stall and asked the lady if she knew how to get to Culion which is our itinerary for the next day. We had to take a boat at the port, which is only available in the morning. Most of the time we spent our time at the deck, looking at the sky, the bay and the town itself. the lighted "Coron" glows across the hills, just like the Hollywood sign, and a few span away you can spot the Cross of Mt. Tapyas. It's breezy, but the downside was the smell of piggy poop in the air. Well, that's life in a rural area, what can be more natural than that. Cảnh tượng này còn long trọng hơn so với bất cứ lão quái nào tới đây. Trong luồng kiếm mang khổng lồ có một đầu thú cực lớn gầm rống rồi phóng ra. Kiếm Tôn Lăng Thiên Hậu ngồi khoanh chân trên Hùng Lân thú, ánh mắt lão sáng như đuốc. Sau lưng lão là bốn đạo kiếm quang hư ảnh, chúng lấp lánh dữ dội làm cho người này càng thêm uy phong! Có mười hai người đi theo Kiếm Tôn! Mười hai người này sau lưng đều đeo những thanh đại kiếm rất cổ, trên những thanh kiếm này có đủ loại yêu thú được huyễn hóa ra, tạo thành mười hai con thú với những hình dạng khác nhau. - Kiếm Tiếu Thập Nhị Tử! Trong tu sĩ khắp bốn phía lập tức có người nhận ra thân phận của mười hai người này.